On Saturday 24 November, some 45 nautical miles south of Tasmania, Investigator’s seabird and marine mammal observation team made an alarming discovery. 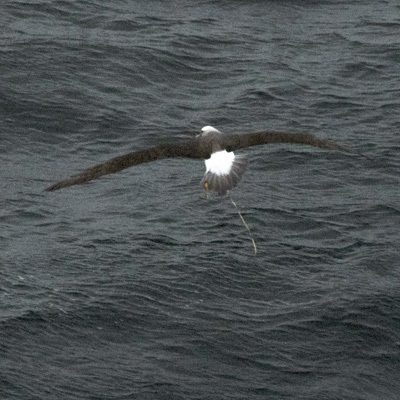 Just off the port bow, a Shy Albatross was shaking an orange shredded balloon with a trailing plastic string. 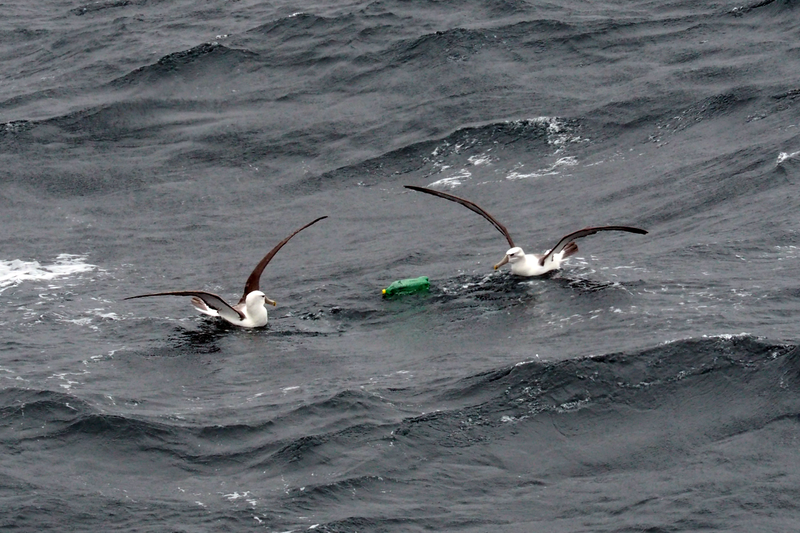 Earlier that day the team had photographed several albatross interacting with a plastic bottle: circling it, picking it up and tossing it between them. “For many people, marine debris is an abstract concept,” Alice said. “It’s out of sight and out of mind. But these images are tangible; something we can share with the public. Alice said reports of negative interactions between seabirds and plastic had been increasing in the past few decades, with seabirds appearing to confuse the floating objects for prey. “Frequently these birds will starve as they fill up with bottle caps, cigarette lighters, toothbrushes, and other plastic items which we use briefly, but which can last forever and often end up in the ocean environment,” she said. The presence of macro-plastics in the Southern Ocean ties into the global debate surrounding the problem of plastics in our oceans. The number of plastic particles in the world ocean has been estimated at 5.25 trillion, weighing 268,940 tons. Additionally, tremendous amounts of plastics and other debris descend from the sea surface to the deep sea. 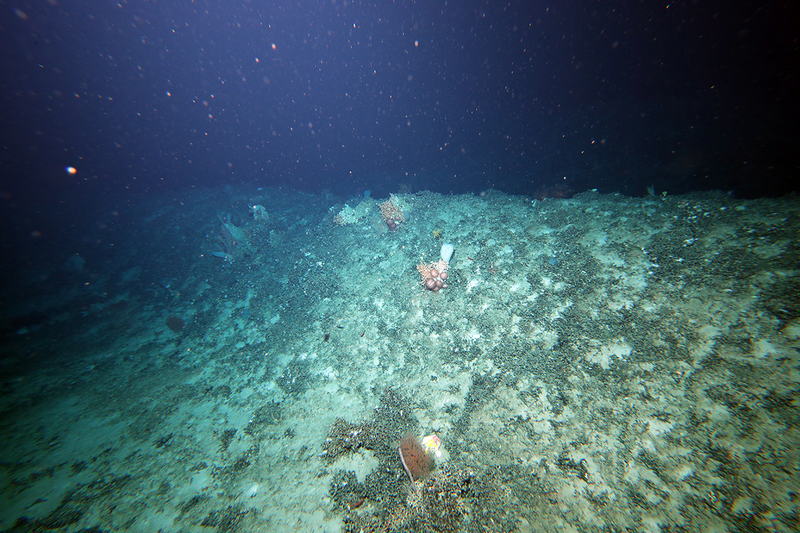 Plastic bags have been observed in the deepest ocean trenches, and this Investigator survey has encountered rubbish on the seafloor: in the beam trawl and on camera. In Australia, steps have been taken to address this issue on a national and state level. Some major Australian supermarkets have phased out plastic bags. In New South Wales, the law prevents the release of more than twenty balloons at any one time, while on the Sunshine Coast the intentional release of helium balloons into the atmosphere has been banned since 2011. Globally, the European Union intends to ban all single-use plastics by 2021. “While legislative change is both important and valuable, it can be a very slow process,” Alice said. “Simple, individual lifestyle changes – such as buying a reusable drink bottle instead of a single use one – can make a huge difference. 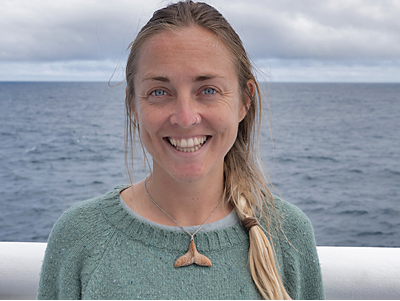 Observations of the distribution, abundance and variety of macro-plastics made by the seabird and marine mammal team during the seamounts voyage will contribute to a global understanding of the scale of plastic pollution. Notes on today's activities, from Marine Biodiversity Hub Director, Nic Bax . . . While the electronic engineers on board switched video cameras on the towed body – not an easy task when dealing with the difficulties of working at depth (at 1000 m the pressure is 100 times that on land) and the complexities of communicating with the digital feed of modern smart digital camera over several kilometres of fibre optic cable – we completed several more multibeam swath transects to help fill-in our detailed topography and bottom hardness maps of this area. These maps will be vital when we attempt to extrapolate what we see in the video transects to the unsampled areas, including the marine parks. The calm conditions were ideal for completing a sound absorbtion experiment, which entailed dangling a pressurized glass sphere up to 1200 m below the vessel and then manoeuvring the vessel over it, so that its reflectance could be measured on the scientific single beam echosounder. This sounder is used to estimate the biomass of fish schools and depends critically on the estimated target strength of the fish species, where the strong variation between species is a function not of their absolute size but the presence and size of a gas-filled swim bladder, as it this that reflects most of the sound. Knowing how much sound is absorbed by the water column is an important variable to account for and this practical experiment will improve existing theoretical estimates. A series of Conductivity, Temperature, Depth (CTD) profiles were completed with water samples taken in addition for onboard analysis of nutrients and other properties. These data will add to the shared oceanographic knowledge of the area used to support oceanographic models, and additionally provide a comparison with earlier profiles in the area, particularly for determining the aragonite saturation threshold which influences the maximum depth at which stony corals live. These corals are the reef building corals so of great interest for the complex habitat that they provide. A beam trawl at 1000 m produced over 30 boxes of shell grit, many invertebrate species and surprisingly two orange roughy. Much sorting will be required. 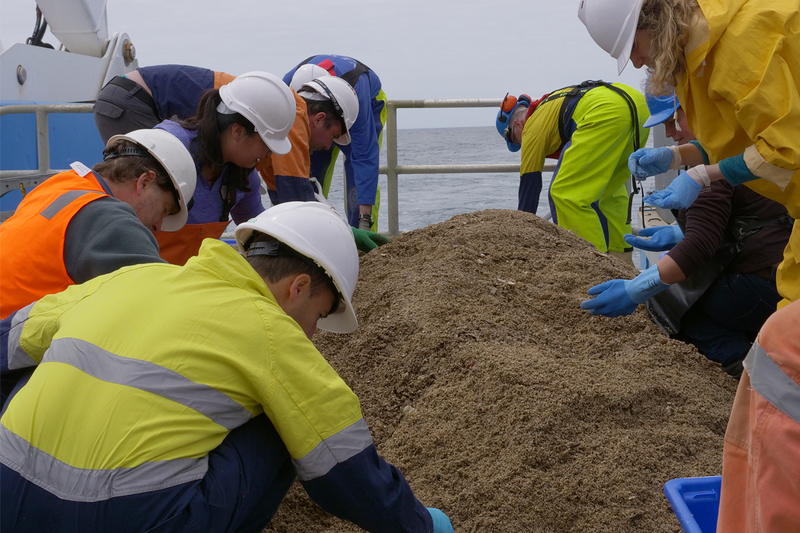 The shell grit in the previous beam trawl contained at least 50 mollusc species, 20 more species than identified so far by the bird observers, but a tiny fraction of the 1800 described marine molluscs from Tasmania. Towed video transects resumed in the evening.